Three weeks in and three weeks to go in our Spirit of Triathlon Photo Contest and we have had some great entries. Visually one of my favorite parts of any Triathlon is the swim. While it is always a challenge to get a cool shot, but this is the only time of the race when as a group. Check out my January 2012 post about swim shots. This is the only time when there are a large number of athletes together. There is always great energy from the start group, whether it is a beach or in water start. Debbie Faulkner in the UK submitted this shot she titled swimming into the sunrise. In addition to the wonderful color of the sunrise, you can see the lead kayak and the stroke of the lead swimmer. Charlie Abrahams also submitted a swim start photo from Ironman Lake Placid 2012. Charlie’s shot is a bit further back in the pack and seems more like a washing machine than a race! Generally people will tell you not to shoot directly into the sun. I do all of the time, you just have to be careful about your exposure. This sounds like another great blog topic for me to add to the list. Lee Gruenfeld has submitted a swim exit shot from the Hawaii 70.3 – as if a 70.3 wasn’t a sufficient challenge for most of us. Here is a Challenged athlete coming out of the water and up the beach! I look forward to more great images. Three weeks to go in the contest and I will write another blog next week. As I had hoped, but without any certainty a batch of new images were submitted for our Week 2 Review. The best part is that the images keep getting better and better and my initial fear of not having a set of 20 great images for our Triathlete.com gallery is now gone. The challenge, which is a great thing, is how to select the 20 most meaningful images for inclusion in the gallery AND we still have four weeks to go in the contest. At the 2012 Triathlon Business International Conference, Rob Urbach, USA Triathlon CEO, upon completion the multi-media presentation that opened his keynote speech turned to the audience and said ‘I never get tired of looking at Triathlon Photos! I completely agree with Rob. I love looking at great Triathlon Photos and lucky for me Rob had included a bunch of mine in his presentation. I love shooting and just seeing great photos, whether they are mine or not. We are so lucky that we participate in a sport where race directors work to have the best venue and manufacturers are always moving forward to have the most aerodynamic and ascetically pleasing designs, to say nothing about the thousands of triathletes who are pushing themselves through their daily training, just to put on a great show for the rest of us. Again, the images I selected for review this week are solely based on what I wanted to comment on and have no bearing on the final outcome of the contest or what will be included in the final gallery. We all know that competing is a family event. Very few of us could ever be involved without the incredible support and understanding of our family and friends and most would never make to the starting line. In this first image, we have a Dave Schutz and his son both wearing number 2613 at about the 18 mile mark of the Ironman Cozumel, with dad sitting on the ground and the next generation triathlete offering encouragement, support and love at a very difficult part of Dave’s Ironman. Photographically, I have always loved the repeating geometric patterns and one of this week’s submissions did not disappoint. 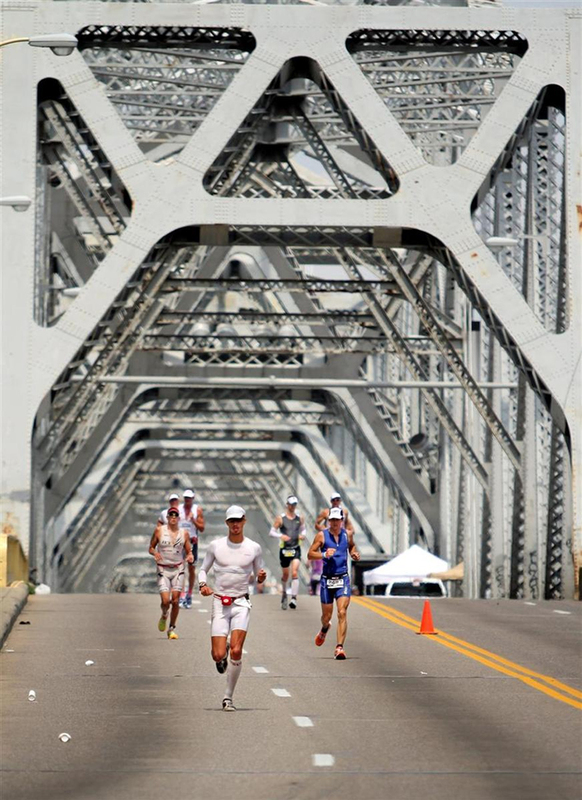 Molly Mullane of Wisconsin submitted this really cool run shot from the Ironman Louisville. Even though this is a very cool shot, it could have been even better! As I have mentioned in prior blogs, I always shoot a series of shots to really try to show the athlete at their best point from a biomechanics standpoint. In this image, the athlete is at the bottom of their stride and although he looks incredibly fit, he looks much heavier than he could have if the photographer has caught them at the top of the stride. Finally for this week, we have the light at the end of the tunnel, both literally and metaphorically. 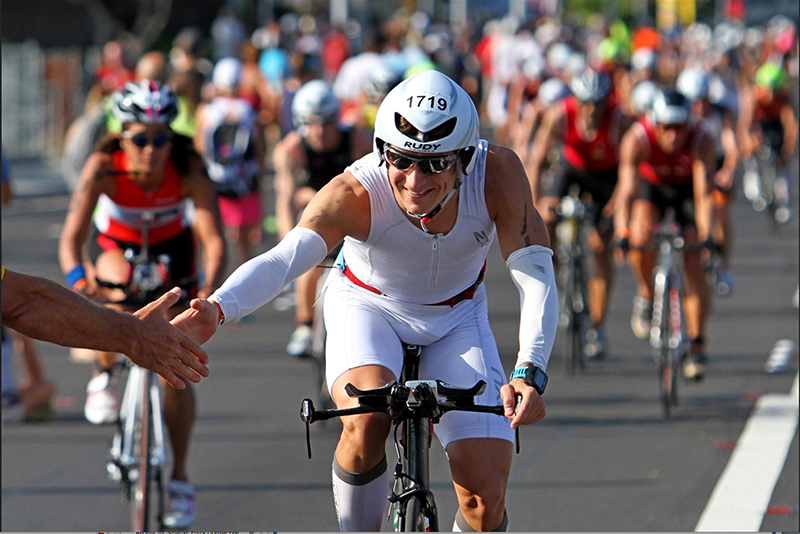 This image is from the Ironman Hawaii 70.3 and was shot by Lee Gruenfeld. Lee is a well-known author who occasionally shoots to supplement his stories. If I could write like that, I wouldn’t have to carry so much equipment. I look forward to more great images, I will post another blog next week. This is going to take a lot of your time. The Spirit of Triathlon Photo Contest is now into its second week and we have had a couple dozen really great entries. So far, I haven’t been overwhelmed with entries, sometimes an iPhone is all you need, it will be great if we get more entries at the end, and the time I am spending is really worth it! I hope this contest will in part further engage all of the incredible supporters of our triathletes. My hopes in naming the contest, the Spirit of Triathlon was that the images would have a strong emotional component, which as indeed seem to resonate with those submitting entries. Here are three of the images that have been submitted. Please keep in mind that selecting images to review in my blog will not have a bearing on the final selection. These are just images that contained elements that I thought it would be useful to discuss. The first image was submitted by Paul Brandt is a young triathlete that shows every bit as much of pre-race anxiety as any pro at the starting line. I think it is an added interesting element that our young triathlete is wearing a cap from the USAT Nationals, while others in the background are wearing different caps. To me it speaks of what is likely a family of triathletes and great role models. This next image is from Kona and shot by Nick Morales. With the main group of athletes out of the water and making their way up Pualani and ultimately heading toward Hawi, there is almost an electric energy in the air that is captured by the rider’s smile and his outreached hand to accept the greetings from a friend. Every triathlete knows that no event would be possible without the support of friends and family. This photo was submitted by Debbie Faulkner in the UK and is an athlete with her family, in sight of the finish line of the UK’s Outlaw Triathlon. Clearly a celebratory moment to share! The paraphrase Charles Dickens in Tale of Two Cities, it is easier than it looks, it is harder than it looks. When I launched my first Competitive Image website in 2004, I had to design the basic layout and determine how I wanted it to look and to work. Of course I wanted to show off my work, give people the best first impression and still give them the desire to look deeper at the galleries from an event. I was always flattered when I had a lot of people looking at images on my site. My 2004 site was build by developers who tried to translate my vision into something that was both functional and could be maintained. Keeping in mind that the only thing I knew about HTML was how to spell it, somehow from 2004 until 2011, I was able to maintain the site with only nominal additional work from the developers. Of course every time I need them to make a change it was expensive! My specialty was reverse engineering and thankfully I didn’t screw too much up, too often. In early 2012 it was certainly well past the time for making a change, but in doing so, not only did I need to have the cash for the upfront investment in the site development but even more demanding I had to decide what I wanted to show and how. I started by looking at the sites of photographers whose work I liked: Joe McNally, Chase Jarvis, Peter Read Miller and others. Not that I was I wanted to build a site that was exactly like theirs or better than theirs, I just wanted to find a great way to display my work. What I found particularly interesting was in the lower left corner of each site, was the note: Powered by LiveBooks. Each site was different and each did a great job of showing off their work. That was April 2012 and I was committed, or so I told myself, to having the site up and running by mid-June with plenty of time to tweak it before I went to London for the Olympics. In the meantime a friend set up a meeting on my behalf with a developer who he thought could help me with my new site. I briefly described what I had hoped to do and showed him some of the other sites that I liked. After a bit of thought, he estimated that the development of a new site would cost around $10,000. My sushi lunch nearly exploded all over the table, I asked about using something like the platform-based site such as LiveBooks. He said that by the time I finally got it to look the way I wanted, the extras would added up to the same cost. In May I was on the road, or more appropriately in the air. I was in Texas, Northern California, Southern California and Madrid. Great races, great people great photo, but not a lot of time to think about a website. The rest of the summer and fall continued at the same pace. What I did decide however was that I didn’t need to provide a full gallery for each event that I shot. Typically I send a medium resolution gallery of selected images to a publisher after an event via an FTP. When they want the high res, I do whatever post-processing is necessary and send it off. If they need something that isn’t included, I get an email and respond with a set of additional selected images. With this realization, I became incredibly lax at maintaining my site. Lax is in fact an over statement of my effort, I just didn’t update anything and yet, I had more images published than ever before. I was now getting to the point where the appearance of my site was a personal embarrassment to me and would refer people to my WordPress Blog, because my blog had current content. Race season ended, with the Medtronic Twin Cities Marathon, the Ironman World Championship in Hawaii and the Bahamas Triathlon, which only left 3 things on my calendar for the balance of 2012: Thanksgiving, yoga and my website. I kept being drawn back to the LiveBooks platform and earlier in the year, I had discussed having a custom site build for $4,200, better than $10,000 but still! I once again looked at their basic formats as well as their interactive home pages and I did find one that I thought with a few changes could be really cool. Even with the interactive home page, I was prepared to compromise. My first job was to go through my images picking what I wanted to display. This was no small task since I shot about 40 separate events doing the year. I spent all day everyday, for two weeks going through images, post processing and optimizing them for the web. My next step was to sign up for the LiveBooks, free trial period – I had received a coupon code to extend the trial period from 14 days to 30 days and used that as I signed up, thinking it would take me most of the 30 days to really get ready. I began my free trial in a Friday and by Monday I was comfortable with the LiveBooks Edit Suite and I activated my subscription and placed the order for an interactive home page. Cost to-date was $400 for annual hosting and the use of the platform and an addition $200 for the interactive home page. $600 in, not bad – but I was certainly ready to adjust my expectations of what could be done with their template. I am extremely lucky in that I have a great friend Carl who is an amazing designer. One of his strengths beyond design is his ability to visualize the users’ experience. It is always challenging to work with Carl and I mean that in the most appreciative and affectionate way. Carl challenges me, makes me think and in the vast majority of the time is spot on in his process. 100% of my interaction with LiveBooks was done via email. In fact, it was somewhat into the process that I realized that my customer service contact, Elena was really based in Romania. Both her understanding of the LiveBooks system and her English were perfect. Once we synced up on the zone differences, things went even more smoothly than before. I would send off requests, comments etc. each evening Minneapolis time and by the time I was at my desk early the next morning I would see the result of the changes. We could do another round in the early morning and then she would be gone for the day. I did have to pay for two additional design changes at $50 each (total cost now up to $700, including the annual fee). If you look at the LiveBooks offerings and then see the magnitude of the changes I have made (and if you knew how picky I am), you could easily understand how this process could take months. The changes of which there were many, took just over 2 weeks. Looking back at the process, I am still impressed with their responsiveness. Best of all, there were no compromises on my part. Of course the list could go on, but these are the primary users of my images. Everyone is of course welcome and I am always flattered, but I wanted to build a site that would show off the quality and diversity of my work, not necessarily the volume of it. Although I still have some content to add, SEO and behind the scenes work to do on the site, the change from my prior site is so dramatic I wanted to get it launched as soon as practical. Will the new site lead to more business? There is no doubt in my mind that it will. In fact, I picked up two small projects solely by showing off the test site before it was launched. Two of my favorite things about my LiveBooks site are: the site scales to fit the size of your screen, so you never have to use the scroll bar to see the entire page; and based on the interactive homepage, you can see 15 of my images without a single mouse click! It was a lot of work to bring the site to its current state, but well worth it and LiveBooks made it much easier than I could have imagined! Take a look if you get a chance. I hope you like what I have done, with a little help from my friends. To honor the Spirit of Triathlon and those who help capture it, we have created the First Annual Spirit of Triathlon Photo Contest. ENTER HERE and after you enter, tweet your photo with the tag #SpiritOfTri. The top 20 selected images will be published approximately March 1, 2013 in a special online gallery on Triathlete.com. In addition, the top three photos will receive prizes courtesy of ThinkTank Photo. The contest will begin today, January 7, 2013 and conclude on February 19, 2013. Be sure to follow us on Twitter @CompImagePhoto and check out the updated Competitive Image Website. In the spirit of triathlon, a portion of the proceeds from each entry will be contributed to the Blazeman Foundation for ALS and to World Bicycle Relief. Every event that I shoot I rely on my ThinkTank gear to have my critical equipment close at hand. In addition to having your image published in an online Triathlete.com gallery, the top photographer will receive an Urban Disguise 35 v2.0 camera bag – great stuff, trust me, you will love it. Second prize will be a Sling-O-Matic 20 camera bag and 3rd prize will be a Digital Holster 10, all from ThinkTank Photo. The 2013 Competitive Image Spirit of Triathlon Photo Contest begins January 7, 2013 at 9:00:00 a.m. US Central Time and ends February 15, 2013, 11:59:00 p.m. US Central Time (the “Contest”). Information on how to enter and prizes form part of these official rules (“Official Rules”). By submitting an entry, each entrant agrees to the Official Rules and warrants that his or her entry complies with all requirements set out in the Official Rules. This is a skill-based contest and chance plays no part in the determination of winners. Contest is open only to all amateur sports photographers who are 18 or older at the time of entry and is void where prohibited. Only minor burning, dodging and/or color correction is acceptable, as is cropping. High dynamic range images (HDR) and stitched panoramas are NOT acceptable. The top 20 images will be published in an online gallery on Triathlete.com. The entrant provides Competitive Image, Inc and Triathlete Magazine / Competitor Group the royalty-free right to publish the images on line and in print. 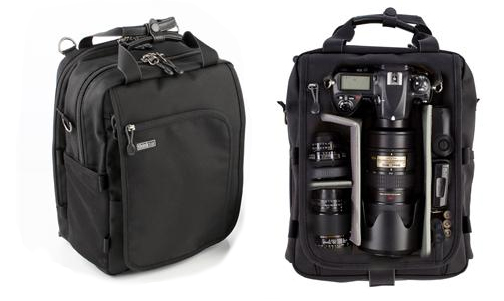 The First Place winner will receive a ThinkTank Photo Urban Disguise 35 V2.0 Camera Bag. Second Place winner will receive a ThinkTank Photo Sling-O-Matic 20 Camera Bag. The Third Place winner will receive a ThinkTank Photo will receive a Think Tank Photo Digital Holster 10. All prized are provided courtesy of ThinkTank Photo.